One of the most common postpartum concerns of women are stretch marks in the tummy, breast or thighs. When I was pregnant with Sean, my mommy friends were very helpful in sharing products and dermatological treatments that help prevent and remove stretch marks or at least improve its appearance. These ranged from topical creams and lotion, laser treatments, dermabrasion, and surgical treatments. The most popular and affordable option is the topical cream, but you have to find the right cream that fits your skin type. 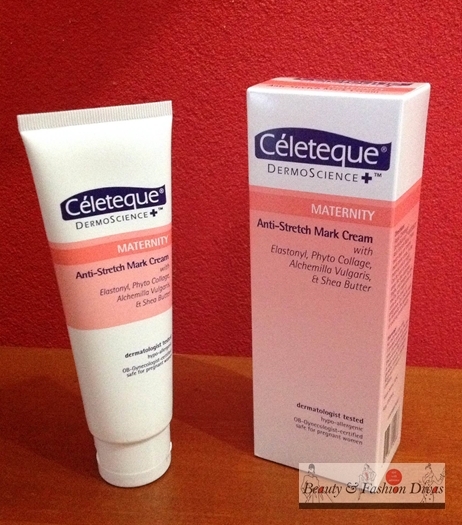 I recently got a product sample from Celeteque which is perfect for expectant moms and those who want to rid themselves of their stretch marks, the Celeteque DermoScience Maternity Anti-Stretch Mark Cream. Whatever remained of my stretch marks is barely visible now because I was vigilant in applying creams and cocoa butter on my pregnancy scars until I could hardly notice them anymore. This is why I appreciate the value of having a good Anti-Stretch Mark Cream that can be used during pregnancy. Future moms need not wait until after pregnancy to address their scarring concerns, Celeteque DermoScience Maternity Anti-Stretch Mark Cream is OB Gynecologist certified safe for pregnant women. This cream helps protect and restore skin tone and elasticity, strengthens and moisturizes skin, and has firming properties. It can be used by both pregnant women and those who are currently working on stretch mark removal. What I like about it is that it doesn’t feel greasy like the body butters and lotion. This light cream is easily absorbed by the skin and its soft scent makes you feel fresh and clean. I have yet to see if this cream can remove the final traces of stretch marks on my tummy because I just started using it. However, it is noteworthy that it does help in moisturizing my skin especially now when temperatures are really low. My tummy felt a bit softer and smoother after a week and I am keeping my fingers crossed that Celeteque DermoScience Maternity Anti-Stretch Mark Cream will be my final solution for stretch marks.